I'm not your mate, sonny jim! Anyway, a while back I saw a listing for some used VHS which were quite obviously from 1988ish as they featured a sponsorship message for the 1988 Olympics on the cover. Yes, that's right, I'm a perceptive old sod! 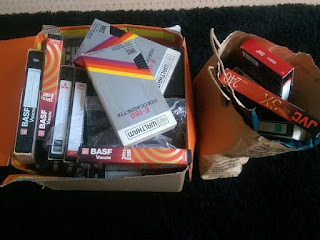 So, I spoke to the seller to see what was on them and explained about my obsession with retro TV. Surely there had to be a whole myriad of forgotten gems packed into this seemingly humble Happy Shopper box. I mean, 150+ hours of footage? If that doesn't spell opportunity then I don't know what does. Turns out that 99.9% of this box, when it comes to spelling opportunity, is crippled by dyslexia. It didn't take too long to scan through the tapes, but believe me it was still a gruelling task. Many simply contained one film or were nothing but back to back South Park episodes from Channel 4. There were a few tantalising moments where I saw the 4Later logo appear, but this was purely reserved for episodes of some US show called Homicide. I was a little dispirited, but I guess I have to appreciate that not everyone shares exactly the same tastes as myself. That's why they were recording what they loved and not concerning themselves with what some TV anorak would consider acceptable in 20 - 30 year's time. However, it's not an experience that I felt was completely galling. The anticipation of what lay within was exciting and, you know, it could have turned something amazing up. Maybe, next time, it will. One interesting little show which did turn up was an episode of This Week from 1987 with Jonathan Dimbleby entitled 'Drugs in Prison' which doesn't appear to be on YouTube. I'll upload that at some point along with some choice ad breaks which caught my eye. 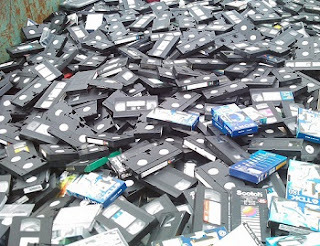 And if you've got any old VHS lying about, just get in touch. I'll even do you a DVD copy. Yes, I'd be exceptionally interested in archiving Big Deal and The Paradise Club! Send me an email and we'll sort something out! Some great VHS covers there, but a shame that the article doesn't go into any depth about the films or why they're worth so much. The Video Nasty value is obviously one of the reasons, but we're left scratching our heads a bit! I can give you all of Babylon 5 as recorded from Channel 4 onto a variety of VHS tapes beginning in 1993. Perhaps not as fun as I've just told you what's on them. Thanks, but it's only British TV shows I'm interested in tracking down. And one's which aren't available on DVD etc. Oh yes, sorry, as per the blog title...! I have a VHS of Z-Cars with 3 of the earliest episodes (Including the first episode), the only legal release of the series on VHS. I do also have the first series of the Demon Headmaster (Again the only legal release) with the first two stories edited together as two movie type stories. If you're interested in these I might be willing to send them if in exchange for a DVD copy of them. I won't be giving away the cover for Z-Cars with it being signed by Brian Blessed and a few of the other cast members. Thanks for getting in touch. I'd be interested in these, so please send me an email - details at the top of the page!